Let’s divide this up a little. First: Lakes. Lakes come in all sorts of variations. Most are man- made, and have a tributary of some sort feeding them. Some are natural lakes, and fish entirely different, yet very similar if you break them down. The kinds and types of structure used by fish may be vastly different, but the reasons fish use them are the same. They live to re-produce! Lakes here in the Ozark's feature lots of deep water, steep drop-offs, and rocks. Lakes across the upper mid-states may not have a tributary, but can contain sharp drops, and weed lines. Lakes across the Southeast may be basically shallow dishpans, but have drastic changes based on wind direction and vegetation types. All in all the fish will relate to what they have, for the same reasons in FL. As they do in MO. Or WI. So, fish need a relative place of safety, with a food source, to survive winter. In. WI. That’s going to be deep water. Obviously. In Florida, that may only be the outside edge of a weedline. Here in the Ozark's, that’s generally a channel drop off or bluff end. Spawning time, regardless of the lake, means shallow cover, and flat bottom with sunlight penetration. That may be holes in the weedbeds, a laydown on a gravel flat, or the base of buckbrush and standing timber. Fish want the same things, no matter where they are. Summer time really opens up the variations. Summer fish in a flat, weedy lake will be shallower than lakes that offer deep water as an option. Weeds put oxygen into the water, and that along with shade greatly increases the attraction of all fish to weed lines. Deeper, river run and highland lakes offer deeper, cooler water, and most have some type of available structure, wood, rock or man made. Fall brings on feeding time, and for our deep water lakes, that means shallow time. For those weedy dishpan lakes, that means weed-lines. Fun times, either way. Fish will be feeding on available forage, and using the available habitat to do it. If that’s a shallow pocket to chase shad into, or a weed-line to trap them against, those fish don’t care, they are going to eat! With rivers and streams, it’s a little different, but not much. Current dictates everything here. 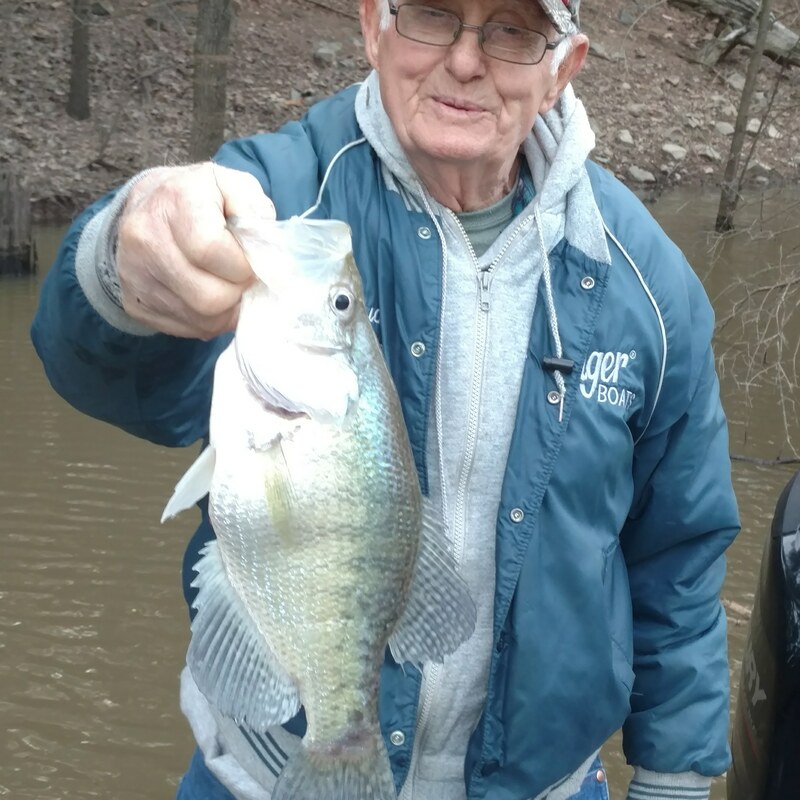 Crappie, even though they will use current, they tend to prefer calmer areas, especially in winter. Bass will use any area out of current, in the winter, and if its available will move into creeks and bays for winter. Come spring in rivers, bass and crappie will both use current to feed on, until spawn time. At that time, they will find the least amount of current available for spawning. Talking about bass and crappie here. Whites, Striper, Walleye all prefer current, and actually need it to fertilize eggs. If those are your targets, know that current areas are the place to look! After spawning time, rivers are the E-Ching! Nothing is better. My opinion. Late spring, early summer, current rules on the river. Fish will be sitting where the food just washes right to them. In smaller streams, this means anywhere there’s a shoaled out area, both in front and below it. In bigger rivers, that can be both in front and behind river levee’s, and along wing dams, and below power dams. Fall in a river can be boom or bust. By fall, bait fish are so abundant in rivers that fish can be almost anywhere. Remember that current still rules, but baitfish can still be chased into backwater areas and bays of the river. Fish are generally really shallow most days in the river, however its been my experience that a “Match The Hatch” is far more prevalent on a river that a lake. Mostly because there’s so much bait in river systems that fish become so conditioned to a size and shape, that you need to be close to what they are eating to get bit. Once you figure that out though, it doesn’t get much better. Now, what does your lake have to offer, based on the seasonal pattern of the fish? It’s coming into spring now, and the fish are in Pre-Spawn mode. Where will they be moving to? Where did they spend the winter? Draw a visual line between that, and go fishing. Remember Daylight rules! Fronts move thru every few days in the spring. Where will the fish move to if the water temp drops, or rises? Look at what the body of water has to offer. Look at the season, and the stage the fish are in. It’s really that easy to locate them. Making them bite…. Well, that’s another deal! Thanks for reading, Next up, Part 4. Approaching your fish! Make a plan!